More than half of the Air Force’s C-5 fleet is available to fly again after Air Mobility Command’s four-star boss ordered a fleet-wide assessment — and three of the aircraft even participated in hurricane relief efforts in Texas. Gen. Carlton Everhart ordered the maintenance assessment of the command’s 56 cargo planes in July after two C-5s were grounded at Dover Air Force Base in Delaware following nose landing gear malfunctions. Everhart said he wanted AMC to look at all of its C-5s as a preventive measure to catch any issues before something potentially goes wrong. On Friday, Everhart told Air Force Times that 38 of the 56 massive aircraft had been deemed ready to fly again. 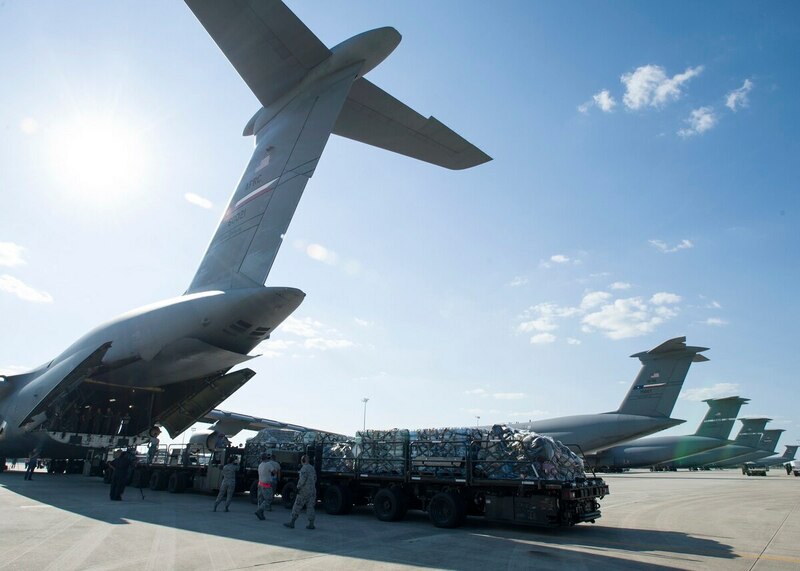 As of Monday, the three C-5s dispatched to support hurricane relief efforts in Texas had flown five missions related to delivering relief cargo, including medical equipment and supplies. One of the command’s recently repaired C-5s flew about 70 airmen from Joint Base San Antonio-Lackland in Texas to the Houston area last Wednesday to transport equipment and supplies after Hurricane Harvey devastated the area. The head of Air Mobility Command has requested a maintenance records check of all 56 C-5s in the command's fleet, according to an AMC spokesman. On July 18, Everhart directed a stand-down of the 18 C-5s at Dover Air Force Base after the landing gear on two of the planes malfunctioned within 60 days of each other. The commander then ordered a fleet-wide maintenance assessment to prevent future malfunctions and stand-downs. The ball screw assembly on the C-5 nose gear was causing issues with the extension or retraction of the landing gear, and maintainers worked to figure out why they weren’t working and how to replace them. The command discovered that the parts the maintainers needed to replace are no longer manufactured, but Everhart said they were able to get them from the “boneyard” at Davis-Monthan Air Force Base in Arizona. Maintainers at Hill Air Force Base in Utah worked on fixing and refurbishing the parts. The command is looking into adaptive manufacturing, Everhart said, which includes 3-D printing parts that are no longer manufactured. To avoid a similar situation in the future, Everhart said he’s interested in predictive maintenance, where the aircraft’s computer system takes data analytics and reports on whether its parts are in working order or if something isn’t quite right. Fixing a part that’s having problems but hasn’t failed yet will prevent a stand-down that could impact an entire fleet and real-time operations, he said. “It drives down the cost and makes the system overall healthier,” he added. However, this would be part of AMC’s modernization program, and Everhart said the technology can’t be added to aircraft through a continuing resolution. “If I can’t get it on the airplane, I’m going to have to rely on good ingenuity from maintainers,” he said.